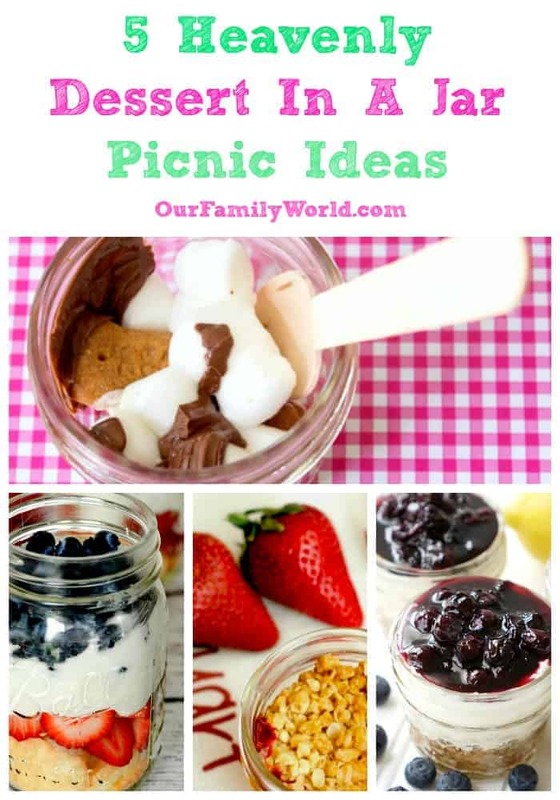 My kids and my brother’s kids are always fighting over dessert when we share at a picnic, so I had the great idea to try some of these desserts in a jar picnic ideas or our next outing! All of these desserts will leave me looking like a mom hero and are individually portioned which avoids squabbles. You can’t beat some of these flavor combos too. S’mores? Banana Split? Blueberry Cheesecake? I’m all in for sure! 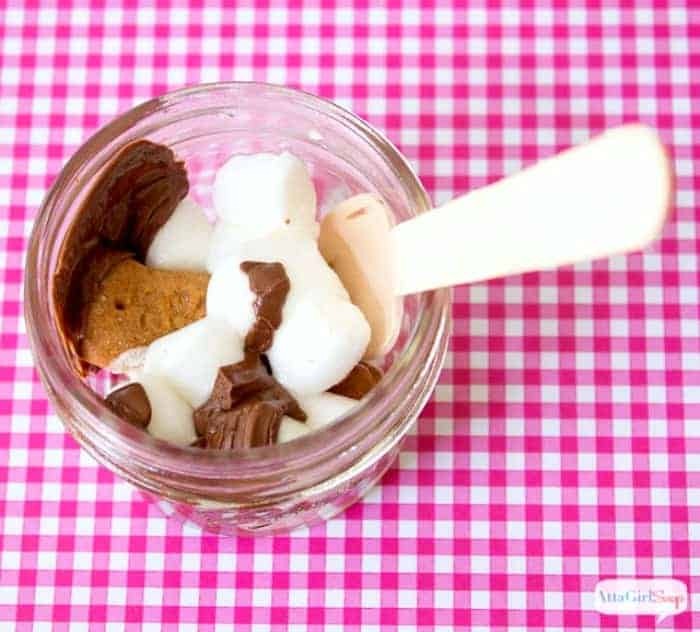 Check out these mouthwatering and no bake dessert in a jar picnic ideas below! Which of these desserts in a jar picnic ideas are making your mouth water? I want to hear what you want to make down in the comments! These Sunshine S’mores are so easy that literally, anyone can make this desert. Even better, this dessert requires no advance baking and only a little prep work. The key to sunshine s’mores is finding a sunny spot to put them in once you set up your picnic. This idea is seriously genius! Every time I hear the word parfait I hear Donkey from the movie Shrek saying “Everybody likes parfaits!” It’s true; I’ve never met a person who did not like parfaits. 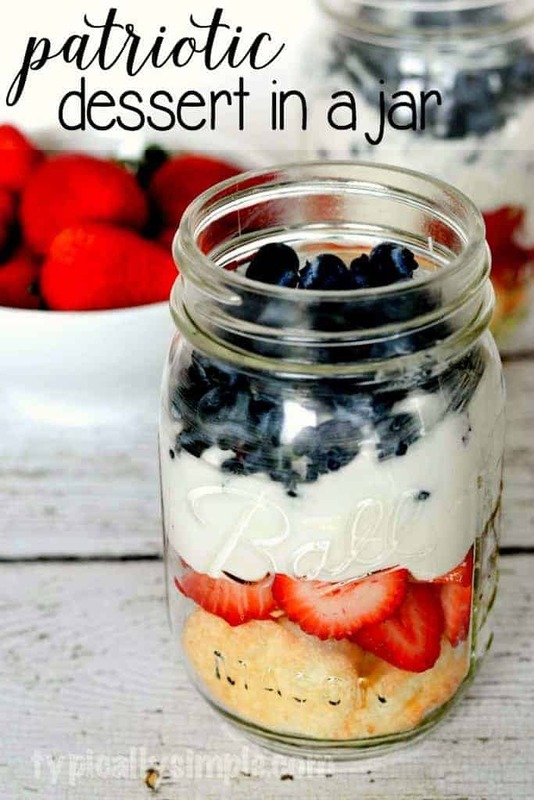 This Mason Jar Patriotic Dessert is the perfect solution for all of those upcoming picnics where you want to cheer for America. (Canadians you could do the same thing with red fruits!) Plus this recipe includes a great combo of cake and fruit that looks mouth—watering. Why hello there Blueberry Cheesecake In A Jar, aren’t you a decadent dessert. Confession time, I made this dessert for my husband the cheesecake connoisseur once, and we ate them sitting in our house. They never made it to the picnic, whoops! If you are making this recipe, you may want to make a few extra because they are irresistible. Banana splits are one of my favorite flavor combos, but it simply doesn’t always make sense to drag the ingredients along for a picnic. 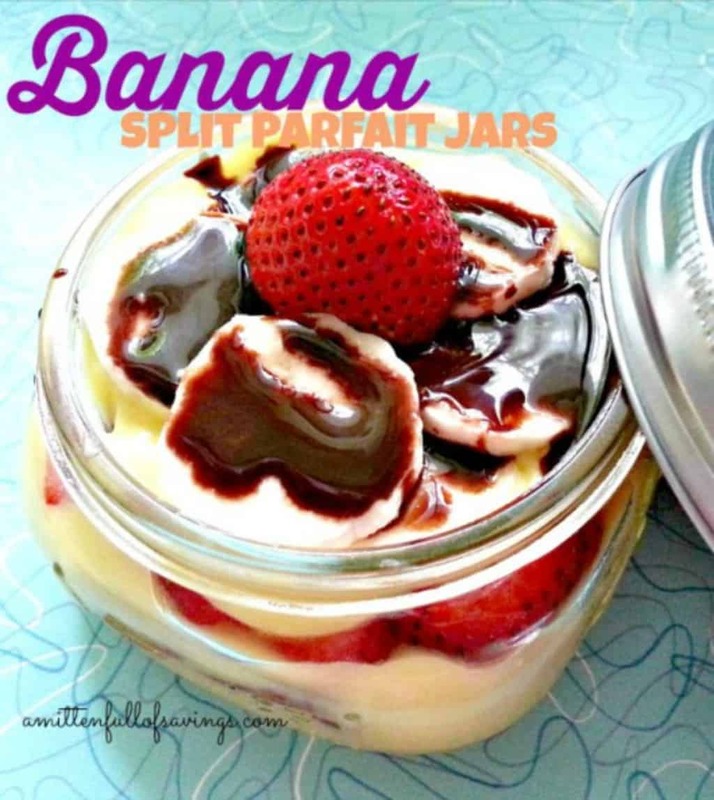 Instead, throw together these cute Banana Split Parfaits Jars in a snap. The pudding gives a creamy taste similar to ice cream without completely melting in your picnic cooler. Yum! 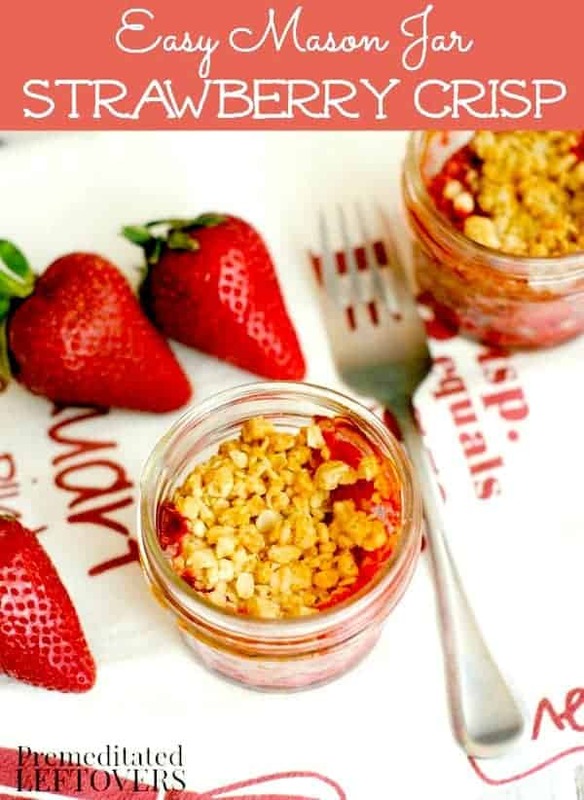 Summer just screams strawberries to me, and this yummy Mason Jar Strawberry Fruit Crisp idea a winner for a picnic. Seriously, mini pies and picnics go together like peas and carrots. Bake these snazzy crisps ahead of time and you’ll have a delicious treat that is buttery, fruity and simply divine. If you like pie-style treats, then this is the dessert you need! no bake cheesecake is first on my list.Thank you. I have 4 teenagers & usually everything is gone by the time I sit down to eat especially dessert! I love this idea because I can make everyone individual desserts!! Thank you because I might get dessert this summer!! Honestly, they all look good to me! What a cute idea for a picnic! Those jar treats are becoming a nice trend for sometime now! Glad to see some fun versions here, I’d take two jars of those strawberry crisps, mmm-yum! I like the red, white and blue. Perfect for this upcoming weekend! My goodness, these are some amazing delicious dessert ideas for a picnic. 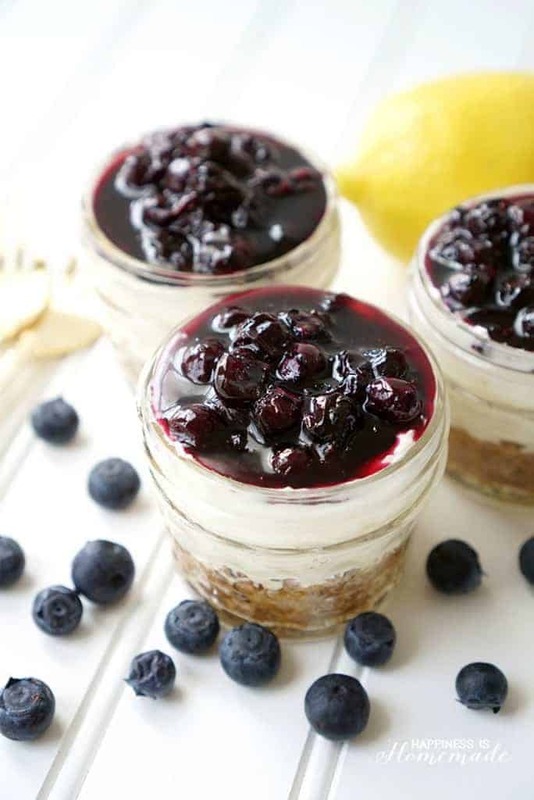 The No-Bake Blueberry Cheesecake & Banana Split Parfait Jars are mouth watering recipes & I am drooling almost at all of them! Mason Jars are all the rage when it comes to making desserts! I really love how convenient they are to bring on trips and on picnics! These all look lovely and I’m definitely keeping the recipes! I LOVE jar meals! They are so portable and convenient. Dessert options are incredibly expanded when you can use a jar. The ones you’ve got here are super clever. Pinning for this summer’s picnics! These look so yummy! I love the patriotic one! The kids love it when I fix their desserts in a jar. I’ll have to try some of these for our picnic tomorrow. What’s the Best Baby Carrier for 25+ Pounds?